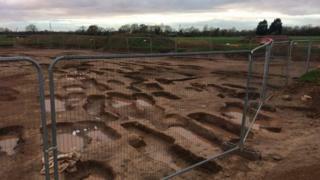 A large pre-Christian cemetery containing about 300 graves, along with evidence of a "horse burial", has been unearthed in a village in Somerset. The "important and complex" site was discovered at Yatton last year during works to develop the land for housing. But North Somerset Council has been accused of keeping the find "hush, hush" and of not informing residents. The council said it "seems" like a cover-up, but publicising cemetery excavations was not common practice. The site sits just below Cadbury Hill, which has the remains of an Iron Age fort and a Roman hill fort. Mark Horton, professor of archaeology at the University of Bristol, said the find could be an "extensive early Christian Roman site" which "would be of national significance". "I'm amazed there hasn't been more public communication between the archaeologists, the developer and the local community - it's almost scandalous," he said. "It's normal procedure - even if the public aren't allowed inside - to put information on the outside about what's been found and it does seem to be really bad practice that there's such secrecy about this project." Local resident Steve Bridger, from campaign group No Moor Development, said the discovery had been "kept so hush hush". "We want to be involved as a community, if there's something significant taking place in Yatton," he said. However Cat Lodge, archaeologist for the council, said it "usually" gave out information, but the human remains made the site "sensitive". "It seems like we've been covering it up, but it's common practice not to publicise the excavation of cemeteries like this to avoid risking the integrity of the site," she said. In a statement, developer Boor Homes said "no identified grave goods" or "datable artefacts" had been found and the "skeletons are in varying states of survival". It added that once investigations were complete and the human remains exhumed, the development would continue.